A new Tulane University study questions the reliability of how sea-level rise in low-lying coastal areas such as southern Louisiana is measured and suggests that the current method underestimates the severity of the problem. This research is the focus of a news article published this week in the journal Science. Relative sea-level rise, which is a combination of rising water level and subsiding land, is traditionally measured using tide gauges. 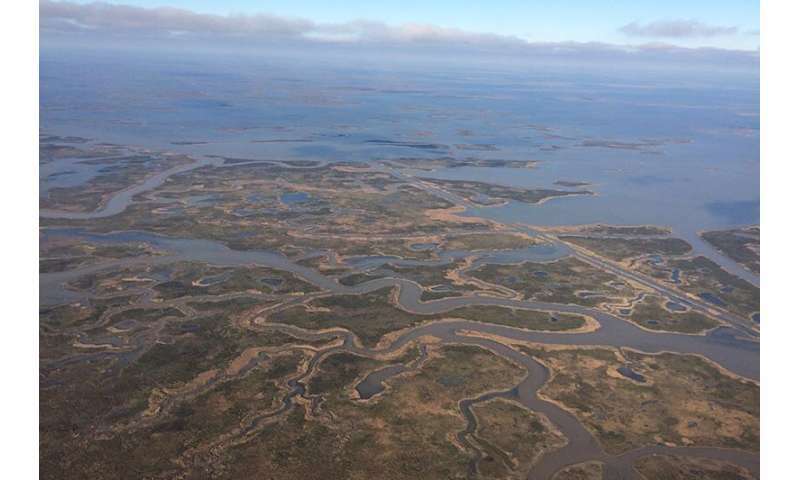 But researchers Molly Keogh and Torbjörn Törnqvist argue that in coastal Louisiana, tide gauges tell only a part of the story. Tide gauges in such areas are anchored an average of 20 meters into the earth rather than at the ground surface. "As a result, tide gauges do not record subsidence occurring in the shallow subsurface and thus underestimate rates of relative sea-level rise," said Keogh, a fifth year Ph.D. student and lead author of the study. "This study shows that we need to completely rethink how we measure sea-level rise in rapidly subsiding coastal lowlands" said Törnqvist, Vokes Geology Professor in the Tulane School of Science and Engineering. The study, published in the open-access journal Ocean Science, says that while tide gauges can accurately measure subsidence that occurs below their foundations, they miss out on the shallow subsidence component. With at least 60 percent of subsidence occurring in the top 5 meters of the sediment column, tide gauges are not capturing the primary contributor to relative sea-level rise. An alternative approach is to measure shallow subsidence using surface-elevation tables, inexpensive mechanical instruments that record surface elevation change in wetlands. Coastal Louisiana already has a network of more than 300 of these instruments in place. The data can then be combined with measurements of deep subsidence from GPS data and satellite measurements of sea-level rise, Keogh said. Rates of relative sea-level rise obtained from this approach are substantially higher than rates as inferred from tide-gauge data. "We therefore conclude that low-elevation coastal zones may be at higher risk of flooding, and within a shorter time horizon, than previously assumed," Keogh said. She said the research has implications for coastal communities across the globe. "Around the world, communities in low-lying coastal areas may be more vulnerable to flooding than we realized. This has implications for coastal management, city planners and emergency planners. They are planning based on a certain timeline, and if sea level is rising faster than what they are planning on, that's going to be a problem." How do you measure a sea's level, anyway? It is pretty clear that so many of the people who are afraid of global warming are hugely angry. I have a hard time believing that they wouldn't do or say anything to promote the idea that global is bad. If they were objective, they would also talk about the benefits of global warming, to the same extent, that they talk about its bad points. Oh dear! Does this mean Al Gore will sell his 12,000 square foot beach front mansion, the one he bought right after his stupid scare film came out? If sea-level rise caused your cess pool to engulf your front yard, would you pause to consider that you could ignore it in order to support Trump? Just askin'. 'Cause I'd get a rope, go find me a denier, and hang them by the ankles over the rising tide of sewage.